304 stainless steel bag filler inlet tube with outer dust control sleeve. Steel frame features adjustable height for flexibility of bag size use. Unit is designed for a 3,500# maximum product capacity. Unit features a pneumatically actuated bag strap release system. Fill head includes a 304 stainless steel inflation ring to accommodate larger spout bags. 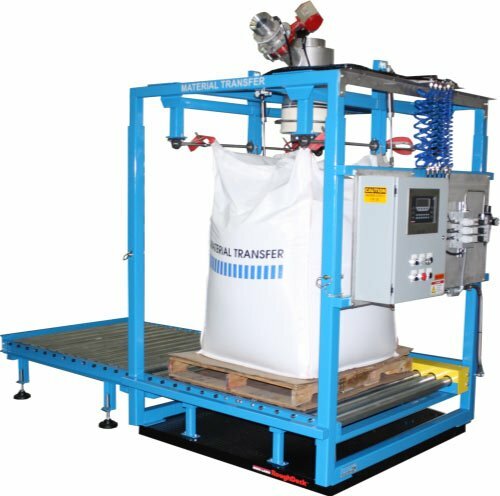 Unit features a 10’ long steel conveyor system with a combination of electric chain driven and gravity roller bases. Gain-in-weight carbon steel scale system (10,000 lb. capacity) with digital weight indicator. Unit includes an 8″ diameter orifice gate with a stainless steel special service inlet (not shown). Gate includes a variable position closed control feature to allow full open, full closed, and dribble flow control positions. NEMA 4 enclosure houses momentary control switches and digital weight indicator. Unit constructed of square structural carbon steel tubing, painted MTS Blue using a high performance, industrial finishing system.